It’s crazy to think back on how she technically should still be 5 since her due date wasn’t until April 27, but due to certain circumstances, she was born on March 24 instead, a whopping 6 lbs and 6 oz at 35+1 gestation. And boy, are we thankful she’s here, and did we ever celebrate! Thursday, March 24 was her actual birthday, so Glenn and I took off work to spend the day with her. Low and behold, guess who woke up on her birthday with a fever? This kid has been healthy all year and has dodged every case of stomach flu, normal flu, strep, pink eye, super lice, etc that has gone around. And yet, on her birthday, she wakes up so sick and miserable. I was so sad for her. We started her morning with donuts and presents while we waited for the doctor’s office to open. 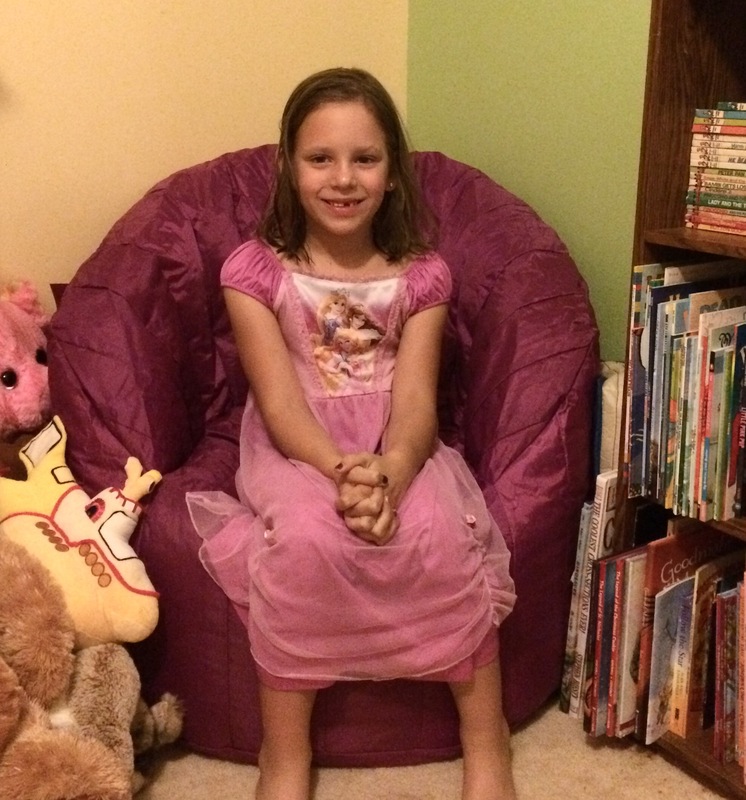 Back in January, she spotted this giant bean bag chair (aff. link) at Walmart and hasn’t stopped talking about it since. She knew exactly where it could go in her room, too… the book nook. 😉 Unfortunately, Walmart was all out of the color she wanted, so we had to order it through Amazon instead. I wanted her to have something to open on her actual birthday as well, so we got her a new bike helmet and elbow/knee pads. I couldn’t stop laughing at the helmet when I spotted it on Amazon (aff. link). We also got her a My Little Pony dress that I found on clearance at Walmart, so when she wasn’t looking, we bought that, too, and she wore it to her party! 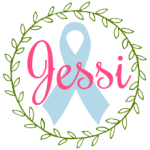 After presents, we took her to the pediatrician to get her tested for strep (it was positive, along with 101 fever by the time we arrived) and antibiotics. Once we got her meds picked up, we went home and dyed Easter eggs. Most of her day was spent on the floor watching movies as she was really lethargic and just not feeling up for anything. We tried a little bit of Jenga, but she just wanted to lay down so we let her binge watch My Little Pony all day. For dinner that night, we did have French Toast, per her request, and it was a wonderfully fun meal. By the time we ate, her fever was low grade and she was already showing signs of improvement. Two doses of antibiotic and she was definitely getting better, although you could still see the sick in her eyes, and her throat was still really sore, it was a good meal. Motrin to the rescue! Zoey woke up on this morning absolutely bouncing off the walls and fever-free. Clearly the antibiotics kicked in quick! My favorite thing was when she said “I prayed for God to make me better and I feel better!” Sweet girl. Glenn and I were already off on this day being that it was Good Friday. To make up for Zoey’s birthday going wrong, we took her to a sushi lunch and to see Zootopia on this day. She was feeling so much better, so the day was much more enjoyable than her actual birthday. This was a really big day for Zoey, and she was extremely exhausted by the time it was over. The morning started with our church’s Easter Egg Hunt, and I was in charge of the logistics that day so we had to be at the park by 8:30 AM to get everything set up for the event. The hunt was at 10, and as usual, the kids cleared the fields within minutes, so we were done before we knew it! We hung around for a little bit and fellowshipped before heading home to pack up the car for the party. This year was probably the easiest party I’ve ever had. I’m normally spending hours in the kitchen, cooking food, baking cupcakes, making table decorations, planning activities, fussing over every last detail, straight up being a Martha. This year, I was determined to have the most relaxed party we’ve ever had, so I ordered the cake through Walmart instead of fussing over cupcakes, I chose a playland at a local church for hosting, and I am SO GLAD I did! Not only was it crazy affordable and flexible to being able to invite more kids, but I didn’t have to do a lot of prep. We showed up with our stuff, they set up my decorations for me, served the kids, cleaned up, etc. They made it SO easy. They even offer to make the goodie bags but we did our own because we wanted to have at least some hand in it! I didn’t have to fuss and worry about if everyone was having a good time, I didn’t have to worry about whether everyone was fed, they did all of that for me. I was able to semi-relax and just enjoy everyone’s presence. The first hour of the party was playtime in the playland, and the second hour of the party was face painting, balloon animals, cake and ice cream, and of course, presents! By the time everything was over, Zoey had a very good birthday weekend, and she is feeling so much better now. I can’t believe that I officially have a SIX year old!